No visible material from asteroid Itokawa was found inside the second compartment of a canister returned to Earth by the Hayabusa spacecraft. However, JAXA also announced that more micron-sized grains have been found in the first compartment, opened earlier this year. Reportedly, the first compartment has about 1,500 tiny particles, however some might be aluminum particles from the container itself. But about 20 grains were rocky or mineral-based. However, according to the Daily Yomiuri Online, no visible material was inside the second chamber, although further investigations of the second compartment will be done with a special microscope. Hayabusa attempted to land on Itokawa twice. The cylindrical canister was divided into two chambers, and the second chamber was to contain material collected during the spacecrafts first landing. JAXA officials expect the second compartment to contain more microscopic particles from Itokawa since the first landing was longer than the second. As far as the particles from the first chamber, several have been observed with an electron microscope, and according to UmannedSpaceflight.com, the rocky ones are 30 microns in size, with several larger ones are about 100 microns. JAXA hopes to provide more insight on the nature of the grains by the end of the year. How about next time actually send something with an asortment of harvesting tools mounted on one or more robotic arms? Laser - only drawback is it could alter the mineralogy in some cases by breaking chemical bonds, but at least it would preserve atomic composition. "How about next time actually send something with an asortment of harvesting tools mounted on one or more robotic arms?" If you had followed this mission, you would understand why no implements were included aboard Hayabusa. The plan for collecting samples was to have the spacecraft hover close to the asteroid, fire a projectile into the regolith and attempt to recover some of the liberated material. 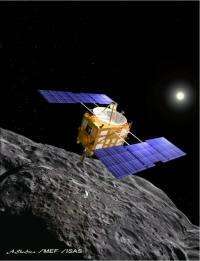 Landing a probe on the surface of Itokawa and performing scooping or brushing techniques in essentially zero-G would be quite difficult (and much more expensive).